Being more than your regular martial arts, Capoeira CDO Perth will help you get into shape and have heaps of fun at the same time. Capoeira is a holistic activity that works all parts of your body, gets you more flexible, strong, resistant and much more confident with what your body can do. The best part is you’ll get all that while having a great time. Our classes are full of energy and fun that will leave you with the feeling of wanting more! Capoeira is also a great activity for the mind and soul. It’s enjoyable, exciting and it brings people together! If you’re looking for a bit of change in your life, then come to Capoeira CDO Perth and we'll help you on your way to being a fitter, healthier and happier you through the joys of Capoeira. Sign up now for a FREE INTRO CLASS so we can introduce you to the world of Capoeira and the Movement of Freedom. Our Capoeira Essentials classes are designed to suit all abilities and previous experience in martial arts, dance, acrobatics or in any fitness program is not required. Our members come from all walks of life, have different fitness levels and range in age from 12 to 65 years old. In the Capoeira Essentials class we work on the fundamentals and essential movements in Capoeira. These are the movements that are roots of capoeira. They are the movements that give you a base with which to grow, develop and evolve your Capoeira. This is the perfect class for beginners and advanced alike, as a tree is only as strong as its roots. Most of our classes are an hour and a half long and you'll be guaranteed a great physical, mental and fun workout. 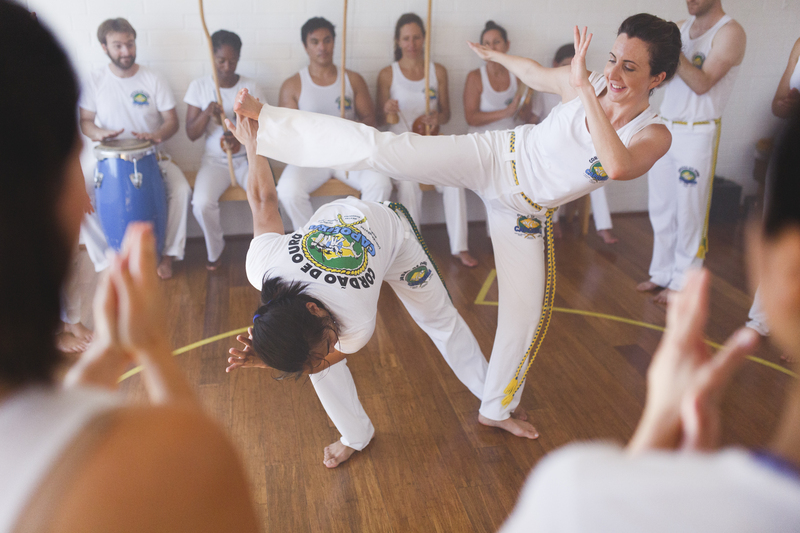 Each Capoeira class is different but all classes have elements that improve your physical well being through challenging and rewarding exercises. You'll learn and practice kicks, dodges, acrobatics, flowing and rhythmic movements and also work on your flexibility, coordination, reflexes & agility. You'll also get the opportunity to learn how to play Capoeira's traditional musical instruments and how to sing songs in Brazilian Portuguese. If that's not your thing though, don't worry! In Capoeira, there is something for everyone! The class will also allow you to feel a sense of belonging to a vibrant community that is inclusive and friendly. Our essentials class follows our Boabá methodology. Each month of the year, you will learn a sequence of movements developed by our very own Mestre Kuata, that, upon completing all 8, will give you all the techniques that you will need to play a flowing, skillful and expressive game that is characteristic of our group Cordão de Ouro. The term Adubo literally translates to fertilizer. The purpose of the Adubo class is to improve your quality of movement in your everyday life from the ground up. Adubo classes are designed to complement your chosen way to move and exercise through improving flexibility, mobility and strength, along with coordination, agility and body awareness.